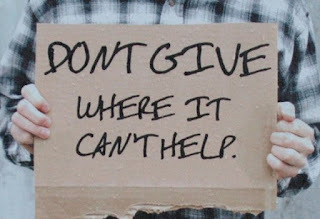 To give freely without knowing or being concerned with whether or not it will be reciprocated. Generosity. The one life skill (a necessary virtue) most of us slack at or simply don't care about. And yet we'd 'almost' demand generosity from others without realizing that we need to give of ourselves first —simply because the same is expected from us. The culture of reciprocity. We're so hardwired with it that we rarely, if ever, feel really comfortable about giving without recompense. And while reciprocity builds relationships and influence, it can also be manipulative when "obligatory gratitude" is expected from (almost demanded of) the recipient in return. Generosity then loses its value. It fails to make a positive impact. Change that. Learn to give and receive freely. No strings attached. That little god, 'consumerism'. These days, we get, we don't give. The 'me first' culture has become so ingrained in our psyche we fail to realize that there's more to life than this obsession with "what's in it for me?". Consumerism. When we pride ourselves in 'paying our way' for everythingl: respect, attention, friendship…even, sympathy. Then again, since we all need these freely given to us, why not do so ourselves first? In fact, that's when reciprocity works best—its payback is not 'obligatory'. It'll be almost 'unexpectedly better'. The fear of scarcity. But, you'd say, it's difficult to give when you have so little. And yet. Our generosity with what little we have is what will actually keep us from having so little. Because when our giving is something that can never be adequately returned, it becomes more valuable. It shakes things up. It builds relationships. It's when generosity binds the giver to the recipient. But when it demands a payback, it becomes a transaction. Cheap. And transactions isolate. Live a life that really matters. Practice this life skill a lot more today. Be generous with your respect, love, attention, hugs, confirmation, sympathy, positivity, strength… It can make all the difference in our 'me first' obsessed culture today.